1 of 1 Combine 25 unwrapped Werthers Original chewy caramel candies (5.5 oz pkg) and 1/4 cup water in a small saucepan. Heat over medium heat until melted. Set aside to cool. Prepare vanilla batter, replacing 1/2 cup of the sugar with packed light brown sugar and remaining 1/2 cup sugar with 1/2 cup of the melted caramels. Add 1/4 tsp ground cinnamon. To frost: Beat 1 package (8 oz) Philadelphia Indulgence dulce de leche caramel and 4 oz cream cheese. 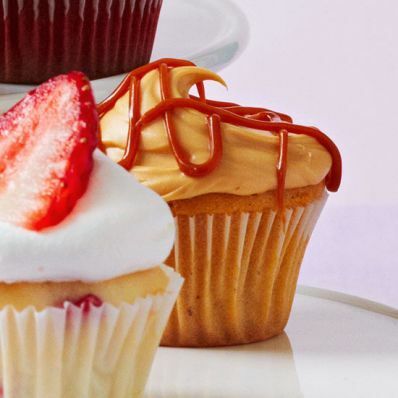 Spread onto cupcakes; drizzle with remaining melted caramels.